Fish is so good for you, we hear this all the time. So why do many of us have a problem eating more of it? 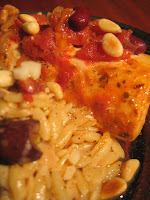 I think the key is finding fun and different recipes; new ways to cook the fish beyond the basic frying and oven baked! When I come up with a fish recipe that even Dave enjoys, then it's gotta be blog worthy. I chose a Mahi Mahi for this which is a meatier white fish, definitely more filling than simple filet's and these will stay together better, but any white fish here will work well. My Grandmother introduced me to orzo pasta. It's tiny little pasta- almost as small as rice. You can use the tasty little pasta in soups or in salads. The orzo pasta side salad is quite versatile and can be paired with meat too. If you haven't tried orzo before, pick up a box today and see comes to mind. Try these two dishes together, or separate - either way, they are both great. And I think you'll find this a great and tasty way to prepare fish. Eat healthy, enjoy the fish and be fat and happy! Sautee the onion in olive oil until tender, about 6 minutes. Add the chopped sundried tomatoes, pepper and oregano and continue to cook another 3-4 minutes. Add in the can of tomatoes, beans and wine. Let this mixture simmer for 10 minutes. Add in the Mahi Mahi, or whatever white fish you like. You can use frozen, but have it thawed before adding in at this point. 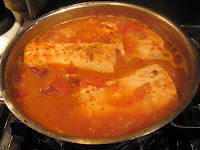 Cover the pan and let this simmer for another 10-15 minutes; when the fish turns opaque and flaky then it's ready. Squeeze the lime over the fish just before serving. Fill a pan with about 6 cups of water and 1 tsp salt, bring to a boil. Begin sauteeing the onions in the olive oil in a small fry pan on a low setting while the water is comes to a boil. Add the chopped olives to the onions and add the pasta to the boiling water - cook al dente (until slightly chewy) then drain leaving some water in the pasta. To do this, pour the pasta in a strainer and rather than shake the water out, pour the past directly into the fry pan with the onions and olives. Add 1/4 cup cream, toss. Turn the flame up slightly on the pasta. Add in Parmesan cheese and allow the cream to warm and the cheese to melt just slightly, top with fresh parsley. 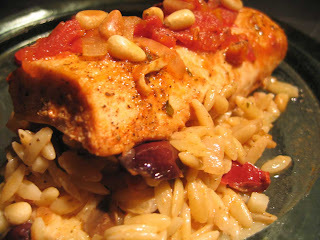 Serve with the Mahi Mahi topped with the toasted pine nuts.